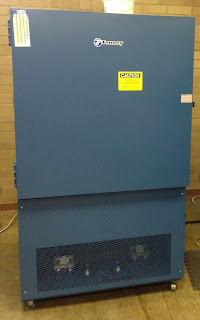 NASCENT Engineering is proud to announce the recent addition of a Tenney Environmental Chamber to our testing facilities. With the acquisition of the Tenney T-30, NASCENT has significantly increased the in-house capabilities and sophistication of our test suite. Capable of testing from -70C to 200C, with relative humidities from 0 to 98% and large enough to contain 2 entire G6 Kiosk cabinets; we can now completely reproduce environmental conditions from the humid Caribbean to the frigid Arctic. We are Manufacturer, Exporter and supplier of Laboratory Equipments, Lab Equipments, Laboratory Instruments, Scientific Equipments, Research Instruments with wide range of Bioreactor Fermenter, Shaker, Growth Chamber, Autoclave Sterilzer, Freezing & Cooling, Incubator, Heating Cooling Baths, http://www.rochmechatronics.com , Freez Drying Equipment, Oven, Centrifuge, HPLC System, Gas Chromatography, FT-IR Spectrometer, Atomic Absorption Spectrophotometer, Micropipette, Gel Documentation, Electrophoresis Unit, Clean Room Equipments, Laboratory PCR, Humidity chamber, Environmental Chamber, Deep Freezer, Laboratory Incubator, BOD Incubator, Laboratory Autoclave, Laboratory Instruments. Humidity Environmental Chamber have been working successfully in many research, Education and agriculture industries. Microprocessor/PID/Digital control provides precise temperature, Relative Humidity and Illumination maintain uniform and accurate growth environment, Timer, Alarm, Auto-Tunning and Auto Stat Stop function. Utilizing a high capacity semi-closed freezing compressor, it maximizes the collecting capability of the cold trap while the installation of a super vacuum pump also maximizes the movement of moisture, A Heat medium, Enhancing the capacity of the Freeze Dryer. Hello, Thanks for explain in detail, ultra low freezer use to save tissue from bacteria in labs by researchers.